is the solution to the problem. you may want to hook in a drink holder. While under way, you may want a binocular holder. BUT WHAT IF YOU WANT TO ATTACH SOMETHING ELSE? Something you made yourself or something that wasn't designed to be mounted that way. When we travel, we dock stern in and have aft boarding steps. At our home dock, we board via the starboard mid rail gate. and the slip not deep enough to go stern in. 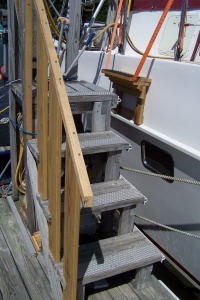 an extra step to aid in the transition to the boat's side deck. and it's all locked in place by the 27073 brackets. When we travel, it just lifts off. now that I've found it, I'm happy to make it available to you. 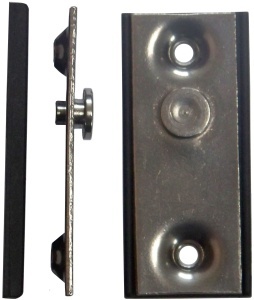 PLEASE NOTE: Most boats in the US have the receiver plate (shown at the top of this page) attached to the boat and the ladder or step terminates in the button end (like the 27073 plate) that hooks into that receiver. 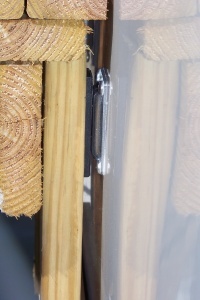 In Europe most boats have the 27073 plate attached to the boat and the ladder or stel terminates in a slot that acts as the receiver. The typical European is done in the opposite way from a typical US connection, but although backwards, the parts still fit. This 27073 plate is the one usually found on the sides of European boats.